I recently had a visitor in my studio (a.k.a. The Art Cave). Mr. Pig of Little Crooked Cottage dropped by. It was fun to have a visitor. It can get lonely working by yourself sometimes. If you want a peek into my studio, check out my visit with Mr. Pig here. The Illustration Friday prompt this week is: unicorn. 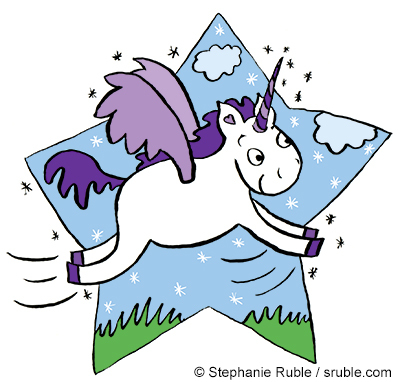 In September, I drew a unicorn to illustrate a guest post for Dani Duck's Smart Dummies challenge (a month dedicated to helping illustrators create a picture book dummy). There are probably many ways to make a picture book dummy, but I can only think of three. I gave them nicknames so they’d be easier to remember [also because it made me laugh]. I’ve actually made dummies using all three ways, though I never know which one it’s going to be when I start. Every book is different. The important thing is to start. The picture book dummy will not make itself, no matter how much you wish it would. - Note: Making picture book dummies is a lot harder than it seems like it should be.